Wedding traditions differ from culture to culture, nation to nation. Some of traditions are actually quite hard to explain. Here are just few examples of such traditions. Let's start with Korea. After the wedding ceremony, friends of the groom take off his socks, tie a rope around the ankles, and start beating soles of his feet with dried yellow corvina. Yellow corvina is kind of fish! It is done so to make the groom stronger before the first wedding night. Koreans believe that if the groom is smiling a lot at the wedding his first child is going to be a daughter. After the wedding groom's parents throw some nuts and plums to the bride. If the bride takes some nuts she'll get many sons. There is also a tradition where guest at the wedding throw some other objects at the happy couple. These objects are chestnuts (symbolizing respect) and jujubes ("daechu") or dried red dates (symbolizing diligence). Money gifts to the happy couple in Korea should be in odd numbers. Koreans believe that they are associated with the positive „yang“ energy. Still on lovely round values of 100,000 won or more the couple will certainly be ready to make an exception. "San-san-kudo no Sakazuki" or just "sakazuki-goto" is the name of the ceremony held at Japanese wedding. In Japanese San-san-kudo means "three, three, nine times". The bride and groom take three sips of sake from each of three cups. The cup used in the ceremony is called "sakazuki". Three cups used differ in size. First three sips are from the smallest one. Number three was chosen on purpose. It is an indivisible numer and Buddhist believe that it is sacred. For them nine means triple happiness. The sake drank during this ceremony is not always delicious. It is the same with life. All kind of troubles will appear. But the bride and groom will have to overcome them with spirit of unity present in the ceremony. For the next tradition let's move to Scotland. There is an old Scottish tradition called "feet washing". It is held on the eve of a wedding. People gather to wash the feet of a bride-to-be. Before the ceremony the ring belonging to a married woman is put into a tub. The first person who is going to find the ring is going to be married next. "Creeling the groom" is an old Scottish wedding ritual where the groom carries big basket full of stones on his back. He has to carry it until the bride comes and gives him a kiss. The Luckenbooth brooch is given to the bride by her groom on the wedding day. In the 18th century these brooches were sold from locked booths in the jewellery quarter of St. Giles in Edinburgh. Some people pin this brooch on the blanket of their first baby for luck. "The first foot" is a person whom the Scottish bride sees first on her way to the wedding. This person gets a coin and some whiskey. He or she must join the bridal procession. 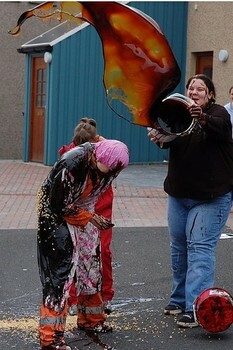 People in Scotland also organize "Blackening the bride". Couple's friends and family members kidnap the bride-to-be and then pour some rather smelly substance on her. Would you like the recipe? Mix eggs, different sauces, butter, cheese, noodles, fish, sausages, carrots. Some extra ingredients can be added. Everything depends on your imagination. When she is "blacken" she is guided through town for everyone to see her. What's the "procedure" for the bride when entering her new home? Before she enters it an oatcake or "bannocks" (a biscuit made of barley and oat flour) is broken above her head. Peaces of bannocks are then share among everyone present. Only then the groom carries the bride over the threshold. In Germany friends of bride and groom kidnap the bride and the groom has to find her. The search starts in a local pub. The groom pays a drink to everyone who wants to join him in search. In the north of Germany people have “Kössenbitter”. He is one of bride's cousins. He wears a tuxedo and hat. His duty is to deliver wedding invitations. Traditionally people give him two glasses of "schnapps" – one for the bride and one for the groom. He has several days to perform his duty. Germans also have a tradition called "Polterabend". It is organized in the evening before the wedding. Friends of the bride arrive to her house and break dishes or plates at her front door. It is believed that this will bring the bride success in her life. She thanks the friends by inviting them for a glass of wine or some biscuits. In some parts of Germany people organize "Paube". It is held several days or even weeks before the wedding. It is sort of engagement party but also a housewarming party in the future home of the happy couple. On the wedding day in Germany the bride carries some bread and salt in her pocket as a wish for the prosperous life of her new family. The groom carries little bit of grains which symbolize success. We are still in Germany. When the bride and groom are leaving the wedding reception it is a tradition to lay some fir branches in front of them. It is done to pave their way with hope, luck and fertility. In Germany after the wedding bride and groom have to saw a log in half working together. This is called "Baumstamm sägen" ("tree log﻿ sawing"). It should show how they are going to solve problems in their life. At the wedding in the Netherlands people traditionally consume alcoholic drink Bruidstranen (" Bride's tears") and sweetmeat known as Bruid suikas ("Bridal sugar"). Bruid suikas is given to guests in a "tuule" bag. The five pieces given represents love, happiness, loyalty, properity, and virility. On the wedding day Dutch couple plants a lily-of-the-valley. This flower should remind them to renew their love as the flower blooms in the spring. In Kazakhstan the couple is officially engaged after the groom's parents put earrings on bride's ears. Before the wedding or "toi" (in Kazakh party, festival) the bride has "uzatu toy" or the farewell ceremony. When the bride arrives to groom's home the ceremony known as "betashar" is performed. During this ceremony the face of the bride is revealed to the groom's family. Traditional songs "zhar-zhar" and "betashar" are sung accompanied by two string musical instrument called "dombira". In Taiwan the groom gives bride 12 presents. These presents can be shoes, jewelry and pagoda shaped candies. What follows is loud reading of the groom's letter of betrothal. Then it is the bride's turn to send 12 presents to groom. She sends objects like goldfish and chopsticks. What is especially interesting is the criteria why these objects are chosen. Words used for objects sent sound quite similar to Chinese words for "plenty" and "fast boy". It is believed that they symbolize wish for prosperous future and wish for the baby boy to be born. On the wedding day the groom in Hong Kong has to pay “luck money” to be with his bride. This money is kept in red packets. The Tujia people, with population of more than 8 million, live in central China. Crying is regular part of weddings there. A month before the wedding, a bride cries for about an hour. Ten days later, she is not alone in her daily weeping ritual. Her mother joins her.Ten days after that, her grandmothers, sisters and aunts join them too. Tuija bride-to-be performs something what is locally known as the "Crying Marriage Song". She weeps in different tones. What is the reason for all these tears? Actually, local believe that this tradition is actually a celebration of happy future for the couple. Tears and mournful atmosphere are there to mislead you. The Yugur people or Yellow Uyghurs live in in Sunan Yugur Autonomous County in Chinese Gānsù Province. During local weddings the groom shoots three arrows to the bride. Do not worry, these arrows do not have arrowheads and nobody gets hurt. At the wedding ceremony the groom breaks the arrows and the bow. This act has a symbolic meaning. For the Yugur it means eternal love and life together. The Daur people live in Chinese Inner Mongolia Autonomous Region and Heilongjiang Province. Some Daur communities exist in the Xinjiang Uygur Autonomous Region. The date of the wedding is settled in rather interesting way. The young man and his bride to be holding the knife together kill a chick. Then they analyze its liver. If it is of suitable appearance the date of wedding is decided. If not the happy couple kills yet another chick. Most of the Lahu people live in Yunnan province in the far southwest of China. Being bald used to be a common thing for both Lahu men and women. Only single girls had hair. After marriage the woman would keep a lock of hair on top of the head. This lock was called “hunmao” or “hair of the soul”. Nowadays this tradition is quite rare. Still those who observe it say that being bald is clean and certainly sign of beauty. 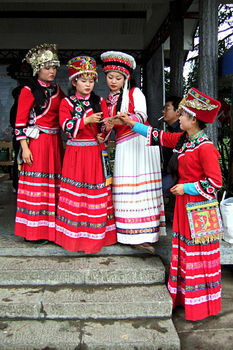 The Gelao (Gelo) people live in the Guizhou Province located in the southwest of China. They call themselves Klau. For the Gelao girl it is not good to be a virgin. It is believed that the girl who gets married as virgin is a bad luck for the family and her future husband. That is why, to become less attractive to local guys, the girl who is still virgin knocks out one or two of her teeth. When Gelao bride arrives to her new home she splash some water over the people there. It is done to scare evil spirits and bring good luck. In Vietnam the groom's mother carries pink chalk and the Betel (Pieper betle) nuts to the bride's home. The pink chalk symbolizes happy future. The Betel nuts are the way of showing respect towards the groom and his family. Only after this ritual the groom and his family can arrive to the bride's home. Last night before the wedding is very important. The bride's mother neatens the hair of her daughter with several combs. Each comb has different purpose. The most important is the third one. When using it the mother will ask for the future happiness of her daughter. In Cambodia there is a "ptem" or knot ceremony. In this ceremony knots are tied on a string bracelet. These knots symbolize the elders' good wishes for the bride and groom. A candle is passed by the married guests to bless the happy couple. Gaat Sah ("Cutting Hair") is yet another of interesting Cambodian wedding traditions. The happy couple sits next to each other. Two singers (one female, one female) dance around bride and groom and kind of clean them of their past life. These singers symbolize heavenly creatures. They "cut" their hair and "perfume" the couple. Then the couple's parents and some guests do the same. The whole rite includes lot of humour. In the south of Thailand 21 years old man traditionally gets married to a tree. The tree symbolizes vitality. So, the man is will be blessed by the Buddha and the Patriarchs. He will be able to find true love and have a happy family the future. On the wedding morning in Malaysia children carry trays with food and animal or flower-shaped envelopes with some money to the bride's house. At the wedding reception guest sometimes get decorated hard-boiled eggs. It is believed that eggs are the symbols of fertility. Tidong (Tedong) tribe lives in the Malaysian state of Sabah and in Indonesian East Kalimantan province. Both are located in the north of Borneo. The newly-wed couple is not suppose to go to toilet for 72 hours. They spend the time in isolation closely watched by their families. They are given small amounts of food and water. No cheating is allowed. Cheating will bring them bad luck like the death of their child at a very young age. The next tradition has lot to do with the astrology. In Vedic astrology Mangal Dosha (Kuja Dosha, Bhom Dosha, Angaraka Dosha) is an astrological condition when Mars is in the 1st, 4th, 7th, 8th, or 12th house of a lunar chart. A manglik is a person born during this condition. In India it is believed that female manglik is cursed and that she is going to cause her husband's death. That is why she has to "marry" some object like for example a banana tree, peepal tree, silver or gold statue of the Hindu God Vishnu. This ceremony is called a kumbh vivah. After the ceremony object is destroyed. Only then she can marry her human husband. People in India have a tradition called "Jaimala" or the Exchange of Garlands. The bride and groom exchange flower garlands (usually made of marigolds, lotus, jasmine and roses) as a gesture of accepting and respecting one another. Garlands are symbols of love. In India male members of both families throw flower petals on the bride and groom as symbols of life without sorrow and troubles. As symbol of being married people in India wear toe rings. Toe rings are called “bichiya” (in Hindi), “mettelu” (in Telugu) and “metti” (in Tamil). Such rings are usually made of silver. People wear them in pairs on the second toe of both feet. During the wedding ceremony the groom puts the bichiya on the second toe of bride's foot while she holds her foot on the ceremonial grinding stone ("ammi"). There is also a tradition of wearing bichiya in sets on four of five toes. The fifth toe on which the ring is never worn is the little pinky. There is an old Hindu belief stating that no gold object should be worn below the waist. That is why some say that bichiya should not be made of gold. Nowadays many do not care about it anymore. And toe rings made of gold and diamond are common thing. In the past there was tradition to wear large toe ring on the great toe as symbol of marriage. Some men in India wear the ring on big toe for medical purposes or as symbol of manhood. These rings are not close circles and that way can be easily removed. In parts of Indian subcontinent the groom will not look directly at his bride. Instead he'll look at the mirror. People will ask him "what do you see". He'll say "Fairy". There is also a Hindu belief according to which rain on the wedding day means good luck. When walking to the wedding chappel children in France traditionally pull the white ribbons of the wedding gown. The bride then cuts these ribbons. What is Charivari? Those of you from France know this tradition. For all others the Charivari (shivaree, chivaree) is a tradition organized for the newly-weds by their friends and family. They gather in front of the house where the couple is spending their first night together. They use all kind of objects (pots, horns, drums etc.) to make noise. It is so, so loud and the couple comes outside and gives them drink or something like that. In France there is a tradition that bride and groom at their wedding reception drink wine from a cup with two handles called "coup de marriage" (cup of marriage) symbolizing their loving relationship. When the happy couple in France decides to leave the wedding reception people put some laurel leaves on their path. In Italy the bride must wear something blue, something old, something borrowed and something new. These objects are believed to bring good luck. It is also customary that the bride wears a veil. Bride's veil is suppose to protect her from evil spirits. It is believed that wearing green during night preceding the wedding day brings good luck. Only bride should wear white at the wedding. Wearing purple clothes by the bride or groom is avoided. In southern Italy usually there are no weddings in May as it brings bad luck. At weddings in Italy the bride usually does not wear any gold as it suppose to bring bad luck. On bride's way to the chappel people put all kind of obstacles. Then everyone carefully observes her reactions. It is believed that way reactions in her future life can be predicted. In front of the wedding chappel Italians tie a ribbon. This special ribbon is a symbol of bond between the bride and the groom. "Confetti" are almonds covered with layer of sugar. They are symbols of bitter-sweet feelings appearing in the marriage as almonds are bitter and sugar is sweet. Confetti always appear in odd number. They are given for good luck. Very important tradition at Italian weddings is called "buste". The bride carries satin bag or "la borsa". Female guests at the reception put envelopes containing money in the bag. Male guests also put some money but they ask for a dance with the bride in return. The money is sometimes collected by the bride's grandmother. There is also a tradition called “cutting” of the groom's tie. The tie is cut into small pieces. Then the friend of the happy couple walks from table to table offering those pieces. He gets some money for every piece. The money collected is given to the couple. Bride and groom at Italian weddings break a vase. The number of pieces it broke into should tell about the number of years they will be married. In Switzerland a bride wears a crown or wreath. The wreath symbolizes her virginity. After the wedding ceremony the wreath is removed and burned. If it burns fast it is believed that the bride is lucky. Swiss bridesmaids traditionally throw coloured handkerchiefs at the guests present at the wedding reception. The guest who catches the handkerchief is expected to give some money to the bride and groom. Very similar to the above mentioned tradition is the one where a "gelbe frau" or godmother gives red handkerchiefs to each guest who in return gives few coins for the happy couple. There is a lovely tradition held in Austria before the bride and groom step over the threshold. They tie their hands together, eat some bread and drink wine. Then the groom throws the glass over the roof. Everything mentioned is done to ensure good luck. Orange is the colour of weddings in Spain. Wedding bouquet there often includes orange blossoms. Brides have orange blossoms in their hair. In Spanish folklore the orange blossom tree symbolizes everlasting love. Orange blossoms are symbols of purity. At the wedding reception in Portugal the bride takes off her shoes. They are then used for the guests to put some money inside. The bride and groom use the money to finance their honeymoon. Important part of the Portuguese wedding reception is called "Copo d' Agua" (cup of water). The bride and groom go from table to table. They chat a bit with everyone. They ensure that everyone is having a good time. The champagne toast is offered when the bride and groom cut the wedding cake. The first piece of the wedding cake is given to a single friend. The bride and groom try to leave the reception before its end. But this is not easy at all. Guests try to keep them busy all night. Some hide their luggage or even their car. In the Czech Republic a day before the wedding bride's friend plants a tree. Such a tree is decorated with painted egg shells and ribbons of different colours. There is a belief that the bride will be happy and have a good life as long as the tree lives. The Czechs also have an interesting tradition held after the wedding. A child is put on the couple's bed. This is a symbol of fertility. Moravian people live in parts of the Czech Republic and Slovakia. At local weddings bride and groom light one big candle. The flame is then passed to next person holding a candle. The person passes the flame to the person sitting next to him. This is continued until all candles at the reception are lit. The atmosphere created is very nice, intimate one. In Slovakia the groom puts the bride on his shoulder and carries her away from the wedding reception. The wedding feast in Poland includes a small table that is put in front of the one where the happy couple is sitting. On this small table there are two slices or cubes of bread, some salt, a silver coin and two glasses of wine. First the couple eats up bread. The bread symbolizes hope that the couple won't suffer from hunger in the future. Then they drink little bit of wine. Wine represent sweetness in life. After that both bride and groom put little bit of salt on their tongue. The taste of salt is not pleasant. This fact symbolizes troubles every couple is going to face during life. The bride and groom hold a silver coin between their right hands put together to show their hope for life without financial troubles. Finally, the parents kiss bride and groom and that way welcome them into two families – bride's and groom's. What follows after this ritual is the band performs Polish wedding toast “Sto Lat” (“100 years”). Polish wedding ends with the bridal dance. A female friend or some family member of the bride puts on an apron. The bride then for few moments dances with each guest. Guests are supposed to put some money in the apron. The first one who dances with the bride is her father. Bride and groom are the last to dance. He has to put his wallet in the apron. After that the happy couple leaves and the wedding feast is finished. In Mexico the groom gives his bride 13 coins or "arras". These coins represent Christ and 12 apostles. Priest blesses the coins. They mean that the groom will take care of bride. Mexicans also have a white ribbon or rosary called a "lasso". During the marriage vows lasso is tied around bride's and groom's neck. It symbolizes couple's unity. The lasso is usually tied by the "padrinos de lassos", which are happily married husband and wife. There is a belief in Mexico that the bride should not wear pearls on her wedding day. Why? Mexicans believe that pearls represent tears and the bride wearing them will cry on her wedding day. In El Salvador the groom and people gathered at the wedding ceremony are waiting for the arrival of bride. Seven men in seven white cars go to her home and bring her to the place where the ceremony is held. Irish people have many different wedding traditions. One of them used to be organized at the start of their wedding meals. The start included three mouthfuls of oats and salt. It was believed that they protect from the evil eye. Very popular engagement and wedding ring in Ireland is the Claddagh ring. It originated in the Irish fishing village of Claddagh, located close to the city of Galway. The ring was first produced in the 17th century during the reign of Queen Mary II. The Claddagh ring includes two hands holding a crowned heart. According to local belief the single woman wears the crown pointing inward. The woman who is in a relationship should wear the crown pointing outward. At the ceremony Irish bride often carries a porcelain horseshoe symbolizing good luck. After the wedding the horseshoe is put above the front door of the family home. The ends of horseshoe should face up to continue the good luck. When the guests are leaving the place where the wedding ceremony was held the bride and groom throw chocolate coins to the guests. Coins are symbols of good luck and prosperity of the couple. Groom at Irish weddings has to be very careful when dancing with bride. His feet have to stay on the floor all the time. Why? If he moves even only one foot off the floor the fairies will steal the bride. Everyone knows that the traditional colour of Ireland is green. But nobody should wear green at Irish weddings. It brings bad luck. In Irish counties of Mayo and Leitrim there is a group of 9 young men called the "strawboys". They wear straw masks or sometimes straw petticoats. They visit the bride's home on the wedding eve. There one of them dances with the bride. Others dance with girls they found there. The next Irish tradition used to exist long time ago. The man who wanted to marry a certain woman gave her a bracelet woven of human hair. This bracelet was symbolic tie which connected them for life. In England people believe that a spider in the wedding dress means good luck. In Wales bride gives some myrtle to her bridesmaids. Bridesmaid whose myrtle sprouts roots and blossoms first is going to marry next. In parts of Greece, like for example in the Dodecanese archipelago, there is a tradition called "making the marriage bed". It is held just before the main wedding festivity in the house where the couple is going to live. Bride's and Groom's fathers are the first who put money on the couple's bed. They are followed by friends and cousins. Then the baby is brought and placed on the bed as symbol of fertility and prosperity. In Greece people traditionally write names of all single women at the wedding party on the sole of bride's shoe. After the party shoe is checked. Women whose names have been worn off will be married soon. Greek bride sometimes carries little bit of sugar in her glove to make sure that her future life will be sweet. After the wedding bride throws a pomegranate at a door covered with honey. If fruit seeds stay sticked on the door the couple will have many children. In Cyprus people have a ceremony called the spreading of the mattress. In this ceremony women dance around the bridal bedding. As part of the invitations to the wedding in some parts of Bulgaria little cakes are sent to the guests. Corn is sprinkled over the happy couple and girls as they dance. The bride kisses rings of all married women at the wedding. Each of these women gives her a fig for luck. Groom's best man in Bulgaria carries a special wedding banner. There are quite specific rules that must be followed in making of the banner. Pole for this banner must be of fruit-bearing tree. It is cut off the tree in a single stroke. On top of the pole an apple or an onion wrapped in foil is placed. This object is not the only attached to the pole. People also put a kerchief, ivy and ribbons. Russians think it is bad luck to get married in May. Some people say that it is because Russian word for May ("mai") sounds similar to "mayatsa" which means to suffer. In Russia bread and salt are offered to the bride and groom. This is done to wish them good and prosperous marriage. It is very rude to cross the path in front of the newlyweds on their way to the wedding ceremony. At the wedding ceremony Russian bride and groom usually stand on a red carpet. The one who first steps on the carpet is believed to be the guardian of the family. Russian bride must be very careful not to drop the ring during wedding ceremony. Dropping the ring is believed to be a bad omen. The box in which rings were kept until the wedding ceremony is taken by the bridesmaid who is planning to get married next. Rather strange tradition exists at Russian wedding receptions. Those who would like to get married soon should secretly pull the tablecloth. It is a bad sign if the heel on bride's shoes gets broken. Russian bride puts a coin under the heel of her left shoe for luck. The groom puts money in his shoes. He gives the money to bride before the wedding night. Wedding celebration in Russia lasts for two days. It starts on Friday and end ends on Sunday. Groom gets in all sorts of troubles when he arrives at bride's home. He is not allowed to see her. He has to pay a ransom („vykup“). The whole event is rather funny. The groom first offers some jewellery or money. The bride's parents bring out a person (female or male) dressed as a bride. She or he wears a veil so her/his face can not be seen. The groom soon realizes that he is cheated. He again asks to see his bride. The parents say that he must pay higher ransom. The amount is finally agreed and the bride is given away . Wedding ceremony can be a religious or a civil one. During civil ceremony the happy couple traditionally breaks two crystal glasses. The number of broken pieces determines years they will spend together. The wedding meal includes several toasts. When the couple make first sip the guests start shouting „gorko, gorko, gorko...“! Russian word „gorko“ means bitter. To make the drink sweet the bride and groom must kiss. The kiss must big as long as possible. During kiss people count „1...2...3...4...5..“. At the part held on the second day of wedding feast guest do not get spoons, forks, knives. They kind of buy them. Without them being at the meal would be pointless. They could bring them but that would really bad taste. After the meal the bride cleans the room floor. The whole act includes rather funny detail. Guests can make mess as much as they want, but only with banknotes and coins. The money the bride manages to collect goes to couples budget. In Ukraine the groom's mother makes a salt sprinkled round loaf. She carries it on a special towel to the bride's family. If the bride excepts the proposal the date of the wedding is set by members of both families. If the answer is no the groom gets a pumpkin. Also in Ukraine, when bride and groom leave bride's house, bride's mother throws several things on them. She throws seeds, rose leaves and coins. They symbolize new prosperous life. Ukrainians have a joke about what bride and groom do during their first wedding night. It is said that they count money. Wedding towels have always played an important role at weddings held in Belarus. Their colours and designs vary from region to region. In the past bride had a towel tied around her hand. On the way to the church she dragged the towel on the ground. That way she marked the path for her friends who are going to get married in the future. After the ceremony the bride also drag the towel around the alter for the same purpose. Nowadays wedding gifts are usually wrapped in a towel. Wedding towels are passed from generation to generation. Handkerchiefs are quite important thing at the weddings in Hungary. Traditionally the bride gives either 3 or 7 handkerchiefs to the groom for luck. In return he gives her a bag of coins. The headdress of bride at traditional Hungarian wedding is rather special. It has strands of wheat woven in the hair. These strands are symbols of fertility. The bride also gets an egg. She smashes it. This ensures the health for her future children. In Lithuania happy couple sometimes wears fur clothes which symbolizes wish for a rich and successful life. Lithuanian bride, after entering her new home, puts a red belt or towel on the stove to somehow get respect of the household spirits. At the wedding reception in Estonia the groom is blindfolded. He is surrounded by the single men. He is then spin around. He tries to put his hat on one of the men. It is believed that the man who gets the hat is going to get married next. According to an old Finnish traditions bride and groom should took a sauna bath before the wedding. They should do it together or separately. In some parts of the country bride of honour put some salt into the water used in bathing. A guard used to stand before the sauna building to keep it safe from evil spirits. Nowadays taking a sauna bath before the wedding still exists and it is usually performed as part of stag nights and hen parties. In Finland future bride wears a golden crown. She walks from house to house collecting wedding presents. She puts them in a pillowcase. She has an assistant. An older married man accompanies her. He holds an umbrella over her head. The umbrella symbolizes protection and haven. In Finland rice is thrown at the happy couple. The grains that remains in the bride's hair is counted. It is believed that number of grains shows the number of children the couple will have in the future. Finnish bride often carries a match. Why? Well, symbolically this match should keep love burning in the marriage. An old Swedish wedding tradition is where the bride walks with coins in her shoes. Her father puts a silver coin in her left shoe. Her mother puts a golden coin in the right shoe. It is important to kiss a bride or groom at the wedding party in Sweden. If a bride for example goes to toilet all the women line in front of the groom to kiss him. It is similar with the groom is out of the room. Then all men line in front of the bride to kiss her. In Denmark there is a tradition where the bride's veil is being torn up by her friends. They keep parts of the veil for good luck. Also in Denmark, if either bride's or groom's parent is deceased the bride's bouquet is put on the grave. In Norway it is a tradition that after the wedding friends and neighbours of the newlyweds plant two small fir trees on each side of their house. These trees symbolize fertility. Norwegian bride traditionally wears white or silver coloured wedding gown. On her head she wears silver or gold crown. In the upper part of the room where the wedding reception is organized Norwegians put small bangles. Lovely melody is created when the bride touches them with her crown. It is believed that this sound scares off evil spirits. Out of many cakes made for weddings in Norway the most famous is the Kransekake ("ring cake"). It is made of marzipan. It includes several concentric rings of cake. Together they make pyramid shaped object. The top of Kransekake is reserved for the happy couple. The bride and groom break other parts and give the pieces to guests at the wedding reception. During slavery African Americans were not allowed to get married. They created a way to somehow show their love in public. With the sound of drums in the background a couple jumped over a broom "into matrimony". A broom was chosen as they believed it was a basic thing needed to start a household. Traditional wedding dress worn by the Navajo bride includes four colour representing four cardinal directions - black for the north, blue for the south, orange for the west, and white for the east. During the wedding ceremony the Navajo couple faces east which symbolizes new beginning. One of the most popular wedding traditions in Puerto Rico is the doll similar to the bride which is put on the main table at the wedding reception. Such doll can have special pins called "capias". These pins are removed by guests and used to pin money on the bride's gown when dancing with her. The bride in Puerto Rico carries a beautiful bouqet. Traditional wedding bouqet includes Poppy flower (Amapola in Spanish) and a fan. This flower and the fan are the symbols of good luck. At the wedding ceremony the priest blesses a plate with coins. The plate is then passed to the bride by the groom after exchanging the vows. The coins are symbols of couple's fortune. Bermuda is a British overseas territory located northeast of Florida. In Bermuda people usually make two wedding cakes - one for bride and one for groom. It is common that one of these cakes is the traditional fruit and rum cake. Two cakes are surrounded by an ivy wreath. The wreath symbolizes love between bride and groom. At the wedding in Yemen father of the groom takes a handful of raisins and throws them onto the carpet. People gathered there try to pick up as many raisins as possible. Why? Raisins are believed to be symbols of the bright future for the bride and groom. Most of people living the Tafilalet oasis located in the southeast of Morocco are Muslim Berbers. The bride belonging to Ait Khabbash (a clan of the Ait Atta) has her face covered with red silk scarf during her wedding. Local wedding lasts for three days. During the wedding she stays in tent. Only the groom is allowed to see her face. In Orthodox Judaism there is the Lubavitch Chassidic sect. At their weddings the groom must arrive without any "knots" on his clothes". He has to untie his tie, shoe laces etc. Knots symbolically mean troubles in marriage. After the wedding ceremony in Australia guests put satin horseshoes on ribbons to the bride's wrist for good luck. The Marquesas Islands ("Te Henua (K)enana" in North Marquesan or "Te Fenua `Enata" in South Marquesan – "The Land of Men) consist of 14 island in French Polynesia. Local wedding ends in rather interesting way. The bride's relatives lay face down forming a row in front of the bride and groom. The couple leaves the wedding reception walking over this "human carpet".